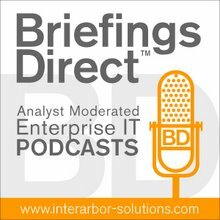 Dana Gardner's BriefingsDirect: Got middleware? Got ESBs? Take this survey, please. Got middleware? Got ESBs? Take this survey, please. Take the brief online survey. I keep hearing about how powerful social media is for gathering insights from the IT communities and users. Yet I rarely see actual market research conducted via the social media milieu. We're seeking to uncover the latest trends in actual usage and perceptions around these technologies -- both open source and commercial.